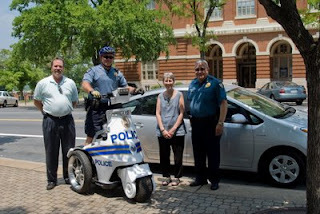 The Athens-Clarke County Police Department has purchased a Vertrix T3 electric scooter and has begun phasing in Toyota Prius sedans for administrative and investigative functions. The Prius is expected to achieve 48 miles per gallon of gasoline as compared to the 15 to 16 miles per gallon of its older vehicles under city driving conditions. The department considers its use of bicycles and motorcycles as part of its strategy to save fuel as well. Bicycles were deployed downtown nearly 20 years ago, and traffic patrol began transitioning from sedans to motorcyles in 1999. This photo from the police department shows the T3 scooter and a Prius. Appearing in the photo (from left to right) are Chris Stratton, Lt. Gary Epps, Mayor Heidi Davison, and Chief Joseph Lumpkin. If that scooter doesn't strike the fear of a vengeful god straight into the dark heart of the underworld, I don't know what will. and won the 2007 law enforcement innovation award. So far as I can determine they cost about $10,000 each. They have a top speed of about 25 m.p.h. but likely would not be safe for regular use on the roadway. Evidently they will be used in pedestrian areas for now. The situation would be similar to having to dodge or avoid those electric cars in airports, but if only the police used them on sidewalks there shouldn't be too much of a problem. It is not clear how cost effective they will be. The toyota Prius cost is about $24,000. This car appears to be a good choice but will likely not get the maximum mileage especially with the air conditioning on. It is easy to bring up reviews of this car on google. Of course, until many of those huge SUV's are off the road, one is at a safety disadvantage in these smaller vehicles. The government could also save fuel costs by changing the very inefficient system in place for leaf and limb pick up. Now, the debris is picked up and loaded on those orange trailers. Two fairly large trucks and a crane are involved in this process operated by two or three employees. The trailers are then hauled across town to the East side landfill. These trucks likely only get 6 or 7 miles to the gallon (or less), possibly more if diesel. A better way would be to transport the debris to local sites since it is not harmful to the environment. It is unnecessary to haul it all the way across town. Or, a better alternative since the debris is not compacted well, is to simply carry a portable shreader like all tree companies use, and grind up the limbs to mulch at the site. Many owners would likely want the remains for mulch and yard use. Any left would much more efficiently fill the trailers and could be hauled to local locations rather than across town. This new procedure could save many thousands of dollars in fuel costs not to mention the additional wear and tear on the trucks, tires, trailers, etc. But the last thing most managers of government want is change. If they did not want to grind the limbs at each address they could simply transport them to more local stations already owned by the government, for grinding or do it more on side streets to address safety concerns of main streets. Shredders cost money and use a lot of fuel. Fuel is going to be saved by making two fewer rounds per year.